Click here to read about our newest project, "Bach, Ragas & Wu-wei," news about our full roster, and a Summer performance calendar. Boston, MA – The Boston Trio returns to the ensemble’s home town for the second time this spring after February’s incredibly well received performances of Beethoven’s Triple Concerto with the Boston Philharmonic Orchestra. One of today’s most exciting chamber ensembles (heard by audiences around the United States, Canada and Europe), the Boston Trio is excited to revive its BT competition, a long-time tradition of the trio meant to give gifted young musicians a chance to perform with the world-class ensemble. This year’s winner is violist Jesse Morrison, a second-year graduate student at the New England Conservatory, studying with Kim Kashkashian. This performance precedes a week of touring in Pennsylvania, where they’re being presented by the Allentown Symphony, Pennsylvania State College, and the Gettysburg Community Concert Association. Use this link to download a full press release. The Clarice, University of Maryland - Virtuoso violinist Irina Muresanu will present her highly acclaimed solo recital program Four Strings Around the World at the Clarice Smith Performing Arts Center on February 5, 2017 at 3.00 pm. The program will feature the newly commissioned pieces by Jerod Impichchaachaaha’ Tate and Shirish Korde. These two commissions – as well as an album to be released later this year on the Sono Luminus label - were a result of the 2016 “Creative and Performing Arts Award” awarded to Muresanu by the University of Maryland. The recital will be a part of UMD’s 2016-2017 Music in Mind concert series which presents premier faculty and guest artists in recital settings. The audio/visual aspect of the program is guest curated by UMD ethnomusicology professor Larry Witzleben. Muresanu’s Four Strings Around the World is a compelling program celebrating the diversity of cultures around the world through the uniting voice of a single medium: the violin. The journey, designed by Irina Muresanu, starts in Europe with the fiddling buoyancy of pieces by Romanian, Russian and Irish composers (Enescu, Shchedrin and Flynn respectively) and two titanic pillars of the solo violin repertoire: Paganini’s Caprice no. 24 and the Bach Chaconne. The program continues sonic exploration through works of composers with musical roots in Persian (Reza Vali), Chinese (Bright Sheng) and Indian (Shirish Korde) cultures. Each of these pieces uses a different modal system, creating a wide variety of sound effects. After a brief detour in South America (via an Astor Piazzolla ”Tango Etude”), “Four Strings” visits North American sounds. (Jerod Impichchaachaaha’ Tate and Mark O’Connor). The Lydian String Quartet, ensemble-in-residence at Brandeis University, will travel to Taiwan for more than two weeks to lead workshops and master classes around Taipei City and for students at the Taipei National University of the Arts (TNUA). The highlights of their visit will take place on December 9th and December 17th, both at the TNUA Concert Hall. The Lydian Quartet embraces the full range of the string quartet repertory with curiosity, virtuosity, and dedication to the highest artistic ideals of music making. The “Lyds,” as they are known to their fans, continue to offer compelling, thoughtful, and dramatic performances of the quartet literature. From the acknowledged masterpieces of the classical, romantic, and modern eras to the remarkable compositions written by today's cutting edge composers, the quartet approaches music-making with a sense of exploration and personal expression that is timeless. Thanks for visiting JMS Artist Management. Use this link to preview our artists' upcoming concerts and projects, or find a list of September and October events here. I am thrilled to join the extraordinary musicians of the Lydian String Quartet. The dedication and musical curiosity they bring to their exploration of traditional and contemporary repertoire is truly inspiring. I can't wait to start making music together. Ms. Segar’s accomplishments range from chamber music recitals to solo performance. In addition to appearances with Boston’s string orchestra “A Far Cry,” she has performed as soloist with the Oklahoma City Philharmonic, Portland Symphony, Arizona Musicfest Orchestra, Oakland-East Bay Symphony, ProArt Symphony, and has developed an ongoing recital project focused on the far-ranging violin and piano music of the early 20th century titled “The Decade Project." Andrea Segar enjoys a varied career as a soloist, chamber musician and teacher. Her previous chamber music appearances include Yellow Barn, the Olympic Music Festival, the Birdfoot Festival, the Perlman Music Program, Music@Menlo, IMS Prussia Cove and Festival de San Miguel de Allende, among others. Andrea’s chamber music collaborations include performances with members of the Emerson Quartet, Juilliard Quartet, Peabody Trio and Mendelssohn Quartet, Soovin Kim, Colin Carr, Stefan Milenkovich, the Doric Quartet, Jean-Michel Fonteneau, Peter Frankl, and Susan Narucki. Andrea is also a frequent guest with the Grammy-nominated ensemble A Far Cry, and has performed on their recordings for Naxos and Crier Records. Andrea’s performances have aired on NPR’s Performance Today and classical radio stations nationwide. Her competition awards include first prizes in the Washington International String Competition and the American String Teachers Association National Solo Competition. As a soloist, Andrea has appeared with numerous ensembles across the country, including the Oklahoma City Philharmonic, Portland Symphony, Arizona Musicfest Orchestra, Oakland-East Bay Symphony, ProArt Symphony, and the New England Conservatory Bach Ensemble, in venues such as the Kennedy Center in Washington D.C. and Jordan Hall in Boston. She also has appeared in recital in the US, UK and Mexico. Andrea recently developed a recital project focused on the far-ranging violin and piano music of the early 20th century, titled “The Decade Project,” at the Maybeck Studio. Andrea received her undergraduate and Master of Music degrees with Honors from the New England Conservatory of Music, where she served as the teaching assistant to Donald Weilerstein. She has served on the faculty of the New England Conservatory Preparatory School and the Music@Menlo program. Andrea was also the head violin studio teaching assistant to Philip Setzer and Soovin Kim at SUNY Stony Brook, where she received her Doctor of Musical Arts degree. College Park, MD – Violinist Irina Muresanu is one of four recipients of this year’s Creative and Performing Arts Award in the College of Arts and Humanities at the University of Maryland. Appointed as Assistant Professor of Violin at the beginning of the 15-16 academic year, Irina Muresanu will use the award to perform her “simply spectacular” (Boston Musical Intelligencer) Four Strings Around the World recital, commission two new pieces for the recital’s repertoire, and record the full repertoire in September 2016 for future CD release. Irina’s innovative project for solo violin has been received with phenomenal praise by audiences and critics alike. It features works by composers who drew inspiration from their own ethnic heritage. These works express a wide variety of musical cultures and thus, a wide variety of techniques of violin playing, from Romanian, Hungarian, Irish and American fiddle playing to the undulating quarter-tones of Arab and Indian music and the pentatonic glassy effects of Asian folk melodies. The main European pillars of the program are the Bach “Chaconne” and Paganini’s “Caprice No. 24”, two staples of the violin solo repertoire. "Four Strings" not only extends the superbly talented Muresanu in new directions, but offers a glimpse into variations of violin technique and approach that would only be gleaned by attending different concerts in various country fairs, Irish pubs, campfire gatherings and parlors. Irina Muresanu Romanian violinist Irina Muresanu has won the hearts of audiences and critics alike with her exciting, elegant and heartfelt performances of the classic, romantic and modern repertoire. The Boston Globe has come to praise her as "not just a virtuoso, but an artist" and the Los Angeles Times has written that her "musical luster, melting lyricism and colorful conception made Irina Muresanu's performance especially admirable" while Strad Magazine called her Carnegie/Weill Hall performance "a first-rate recital". Irina Muresanu's performances have been frequently cited as among the Best of Classical Music Performances by the Boston Globe, and her recital in the Emerging Artist Celebrity Series was named one of the Top 10 musical events by the TAB Magazine. Irina Muresanu currently serves on the faculty of the University of Maryland and has taught in the Music Deptartments of Boston Conservatory, Harvard and MIT. Her ensemble, the Boston Trio, was Ensemble-in-Residence at the New England Conservatory, the institution at which she received the prestigious Artist Diploma degree and a Doctorate in Musical Arts degree. Praised and honored for “his ability to effectively infuse classical music with American Indian nationalism (Washington Post),” Jerod Impichchaachaaha’ Tate, born in 1968 in Norman, Oklahoma, is a citizen of the Chickasaw Nation and its Composer-in-Residence. Tate is dedicated to the development of American Indian classical composition. His original, commissioned works have been performed since 1992 by the National Symphony Orchestra, Detroit Symphony Orchestra, Minnesota Orchestra, Colorado Ballet, the Santa Fe Chamber Music Festival, the New Jersey Chamber Music Society and the Philadelphia Classical Symphony, among others. His work for the Oklahoma Educational Television Authority Documentary, The Science of Composing, won an Emmy Award in 2011. Tate earned his bachelor’s degree in piano performance at Northwestern University and his master’s in piano performance and composition at Cleveland Institute of Music. He was appointed Creativity Ambassador for the state of Oklahoma in 2008. Among works available are Iholba’ (The Vision), for Solo Flute, Orchestra and Chorus and Tracing Mississippi, Concerto for Flute and Orchestra, recorded in 2007, on Azica Records. Shirish Korde is celebrated for “integrating and synthesizing music of diverse cultures into breathtaking works of complex expressive layers.” His works have been performed by orchestras such as the Chicago Symphony, The New Zealand Symphony, Boston Philharmonic, the National Polish Radio Orchestra; and ensembles such as The Boston Musica Viva, Da Capo Chamber Players, The Ensemble Modern and others. He has received many grants and awards including the National Endowment for the Arts, The Fromm Foundation, and The Siemens Foundation. His works can be heard on Chandos, Neuma, Centaur, and Mode. His music is influenced by diverse world music traditions ranging from the throat singers of Tuva and the ancient Vedic chants of India, to the shimmering colors of the Balinese Gong Kebyar Gamelan orchestra. His distinctive music is performed throughout the United States and Europe. We had a great time talking about our artists' new projects at the Chamber Music America conference last week. There's news about artist roster additions coming soon! As of 12/1/2015, JMS Artist Management will discontinue representation of clarinetist Michael Norsworthy. Michael and JMS Artist Management enjoyed their collaboration for nearly three years, but have both decided that it is time to focus on different projects. Rapidly gaining recognition as one of the greatest artists of his generation with an international career, cellist Jonah Ellsworth joins the Boston Trio, an ensemble with time-tested artistry. Jonah has been selected as a fellow for the 2016 Piatigorsky International Cello Festival, and will return to the Marlboro Music Festival for the third time in 2016. Jonah has studied with Laurence Lesser at New England Conservatory and Peter Wiley at Curtis Institute of Music. Other teachers include Andrew Mark and Natasha Brofsky. Founded in 1997, the Boston Trio has developed a consistent reputation of artistic excellence and received steady critical acclaim. Collaborating with violinist Irina Muresanu and founding pianist Heng-Jin Park, Ellsworth is eager to contribute to the legacy of this chamber ensemble. Past performances of the Boston Trio include presentations at Detroit Pro Musica, Rockport Chamber Music Festival, Cape Cod Chamber Music Festival, and a nationally televised performance at Belgrade Music Festival in Serbia. The trio members that Ellsworth is soon to be collaborating with also look forward to this promising new opportunity. “We are overjoyed to have Jonah join the Boston Trio. He's one of the greatest cellists of his generation and we are extremely inspired to make music on the highest artistic level with him. I believe audiences everywhere will be thrilled to witness this new incarnation of the Boston Trio and we look forward to sharing our music with them” says pianist Heng-Jin Park. Fellow string player in the ensemble violinist Irina Muresanu readily says of Ellsworth’s inclusion, “I am thrilled to welcome Jonah Ellsworth to the Boston Trio. He is an exceptional cellist with a virtuosity and understanding of the music far beyond his years.” Irina has known Jonah for many years and watched his ascending trajectory, which makes the new addition even more meaningful to her. 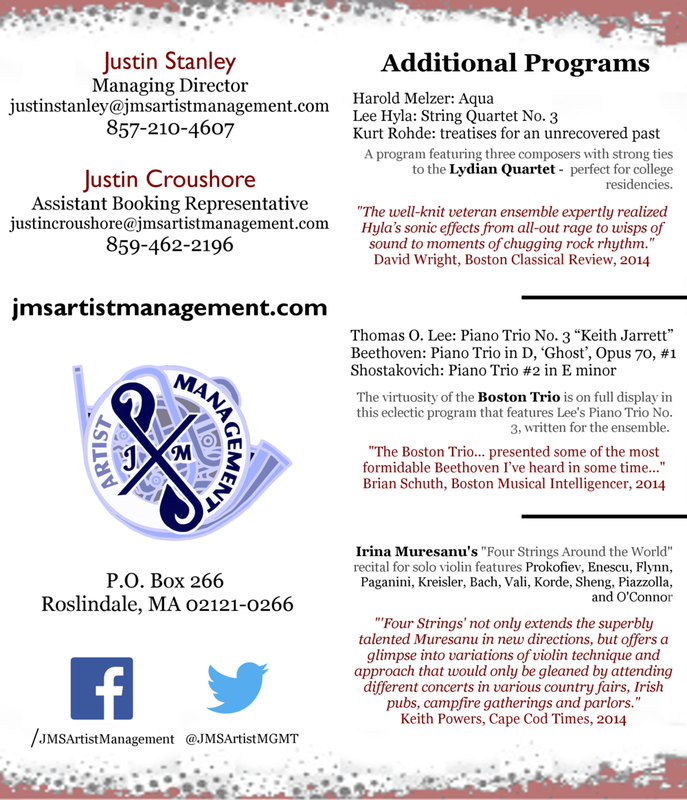 For more information, please contact Justin Stanley of JMS Artist Management at justinstanley@jmsartistmanagement.com or by phone at (857) 210 4607. The Boston Trio’s next concerts are in Virginia this coming December. Please visit www.bostontrio.com for more information. Boston-based violinist Irina Muresanu has been recently appointed Assistant Professor of Violin at the University of Maryland School of Music. She will begin her time at UMD in the Fall of 2015. Ms. Muresanu has won the hearts of audiences and critics alike with her exciting, elegant and heartfelt performances of the classic, romantic and modern repertoire. The Boston Globe has come to praise her as "not just a virtuoso, but an artist" and the Los Angeles Times has written that her "musical luster, melting lyricism and colorful conception made Irina Muresanu's performance especially admirable" while Strad Magazine called her Carnegie/Weill Hall performance "a first-rate recital." Irina Muresanu's performances have been frequently cited as among the Best of Classical Music Performances by the Boston Globe, and her recital in the Emerging Artist Celebrity Series was named one of the Top 10 musical events by the TAB Magazine. Recent projects and performances include her recital program “Four Strings Around the World,” a solo violin recital featuring works of composers inspired by various musical cultures around the world. An early reviewer of the project wrote that “[W]hen the D Major section moves into D minor [in Bach’s Chaccone], it seemed as if the violin had had its heart broken and was crying. Muresanu’s performance was simply spectacular.” Other projects include the premiere of Thomas Oboe Lee’s Violin Concerto (dedicated to Ms. Muresanu), and a recording of William Bolcom’s complete Violin Sonatas, released on the Centaur Label. For more information on Ms. Muresanu including her performance schedule and bookings, please contact Justin Stanley of JMS Artist Management at jmsartistmanagement@gmail.com or by phone at (857) 210 4607. Astrid Schween, current cellist of the Boston Trio, will join the Juilliard String Quartet for the 16-17 season, replacing cellist Joel Krosnick. The Boston Trio is pleased to announce that Astrid Schween will join the Juilliard String Quartet in the Fall of 2016. As a member of the trio, Schween performed on tours to the Southwest United States, California, Michigan, and all around New England. Highlights include performances at UCLA, Pro Musica Detroit, Concerts at the Point in Massachusetts, and the trio’s annual concerts at the New England Conservatory’s Jordan Hall. This summer, Schween will be heard with the Boston Trio at the Rockport Chamber Music Festival and the Cape Cod Chamber Music Festival. Astrid will tour with the Boston Trio next season from coast to coast, including performances in Williamsburg and Norfolk, VA, and at Four Seasons Arts in Berkeley, CA (dates to be announced). A Boston Trio album with Astrid will be released later this year featuring the works of Arensky, Musto, and Faure. “Whenever this trio plays, drop everything and go hear them!” – hailed the Boston Globe on the occasion of The Boston Trio’s Tanglewood debut at Ozawa Hall. Since their formation in 1997, the Trio has become one of today’s most exciting chamber ensembles. Acclaimed for their superb sense of ensemble and wondrous balance, these virtuosic and profound musicians are committed to creating engaging and daring performances of standard and contemporary repertoire. Recent highlights for the Boston Trio include performances at UCLA, Detroit Pro Musica, the University of Arkansas, Maui Classical Music Festival, and the Cape Cod Chamber Music Festival. The Boston Trio has been invited to perform on numerous prestigious series such as the Bank of America Celebrity Series, Sanibel Chamber Music Festival, Virtuosi Concerts in Winnipeg, Rockport Chamber Music Festival, Carnegie Hall’s Weill Hall, Brigham Young University, Gualala Arts Chamber Music Series, and Bay Chamber Concerts in Maine. The Boston Trio is the Ensemble-in-Residence at the New England Conservatory. For more information about the Boston Trio, please visit www.bostontrio.com.